Which is better, for my readers - Atom or RSS? How do I choose, what to provide, in my blog? The competing newsfeed formats - Atom and RSS - have been a part of Internet life, for many years. Both formats have their devotees - and this is why there are two formats. You can change the URL of a FeedBurner source feed, to select Atom or RSS feed formats, from your blog. 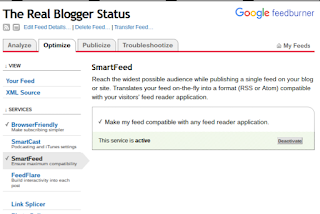 You can use FeedBurner, or edit the blog template, to select a feed format. Use the FeedBurner "Edit Feed Details" wizard, if you redirect your blog feed to FeedBurner. If you don't use FeedBurner, you can edit the blog template, and manually change feed URLs. Note this will involve editing the post template, to change some links in the blog. This is not a recommended solution. You may choose from 5 blog posts feed URLs, provided by this blog. You can do the same, with your blog. Do you really want to select Atom or RSS this way? FeedBurner has two services, that let you mix and match Atom vs RSS. 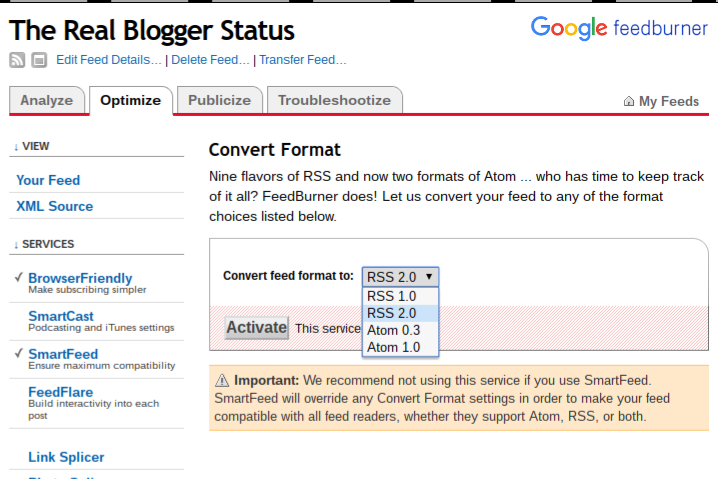 SmartFeed dynamically serves the right choice - Atom vs RSS. Convert Format Burner lets you statically select one format, or another. Using either service, FeedBurner selects the desired feed format for you - regardless which Original Feed URL you provide, in "Edit Feed Details". Just give FeedBurner the default feed URL for your blog " ... /feeds/posts/default" - and let FeedBurner do the work, depending upon the service that you select. You activate either service from the FeedBurner dashboard "Optimize" tab. Note that you should choose only one service, for each FeedBurner feed provided. Important: We recommend not using this service if you use SmartFeed. SmartFeed will override any Convert Format settings in order to make your feed compatible with all feed readers, whether they support Atom, RSS, or both. 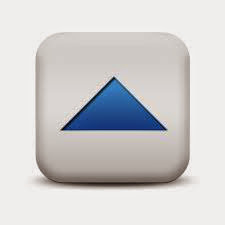 "SmartFeed" selects the best format, dynamically. For the best experience by all readers, SmartFeed will automatically provide the feed format favoured by any feed reader used - as each reader views your feed. Translates your feed on-the-fly into a format (RSS or Atom) compatible with your visitors' feed reader application. 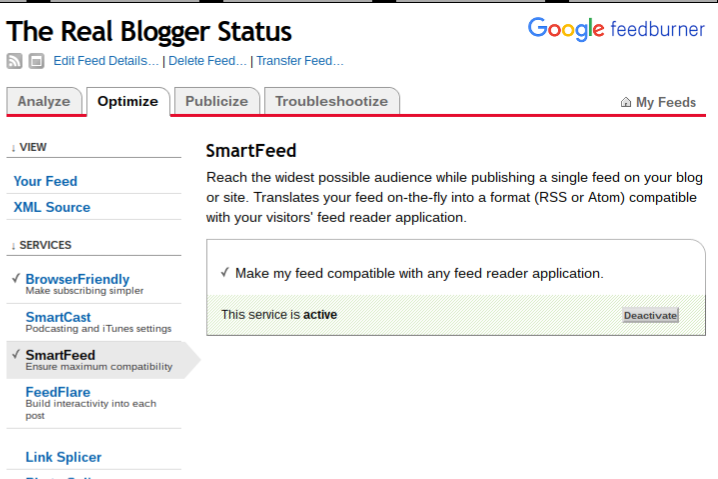 Enable SmartFeed - and let FeedBurner choose the best format, for each different feed reader being used. "Convert Format Burner" lets you choose the format - and version. 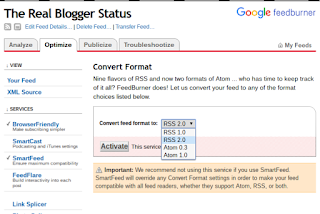 If the choice of feed format (Atom, RSS) - and even choice of format version (Atom 0.3, Atom 1.0, RSS 1.0, RSS 2.0) - matters to you, you can use Convert Format Burner, and select a specific format and version. Nine flavors of RSS and now two formats of Atom ... who has time to keep track of it all? FeedBurner does! Let us convert your feed to any of the format choices listed below. Enable Convert Format Burner - and you choose what feed format and version gets served, to all feed readers. You can have multiple feeds, and multiple FeedBurner outputs. If you have conflicting requirements, you can always setup multiple different FeedBurner feeds - and use different feed service options, for different feeds. You can then provide each feed in a consistent display, using the "BrowserFriendly" service. If you want to serve the right newsfeed format from a #Blogger blog, you can either tweak the code in the blog template - or you can use a #FeedBurner feed, and activate the "SmartFeed" or "Format Burner" service. Using FeedBurner is a simpler choice, than the template editor.